I have always loved the back-to-school season. New teachers, new shoes, new supplies…there’s so much “newness” to enjoy! One thing I do not enjoy, however, is The Packing of the School Lunches. Packing school lunches always seems to take me much longer than I had planned, and I never remember to do it until I am just about ready to head to bed. And who wants to be making sandwiches and bagging carrot sticks at 10:30 p.m.?? Not me! Fortunately, there are better methods than mine for packing school lunches. 😉 Today, we’re outlining a 3 step process that will save you loads of time by allowing you to prepare a week’s worth of school lunches in just one afternoon. Plus, we are throwing in two bonus tips to help make lunch packing even easier! Instead, try to have some “standby” items that you can pack on a repeating basis. For instance, buy several pounds of turkey and then plan to pack turkey sandwiches a few days that week. Another tip: look ahead at your dinner plans for the week, and anticipate leftovers. For example, if you are grilling chicken one night, throw an extra piece or two on the grill and then use the leftovers to make sandwiches or wraps. Another bit of advice: let the grocery store ads guide you. Buy produce, bread, juice, snacks, etc. when they go on sale, and then plan to work it into your lunch menu. This will save you a surprising amount of money over time. 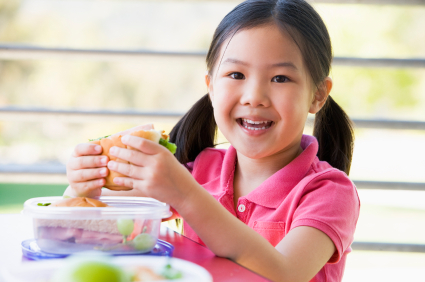 A final tip: want to create healthy school lunches, but not sure exactly what to pack? Check out MOMables. Created by a real-life mom, MOMables does all the lunch menu planning for you. Each weekly menu plan comes with tips, fun ideas, and even a printable grocery list! Prep Your “Side Dishes”. It makes sense to do this on Sunday, so that everything is ready for the week ahead. (Of course, feel free to pick a day that works for you, if Sunday is no good.) Prep all of your lunch “sides” – slice carrot and celery sticks, bag up grapes, portion out pretzels and chips. It’s a good idea to keep a container in your fridge for your cold sides (produce, milk products, etc.) and put all of the pre-bagged items in there. Then, put a second container in your pantry for all the “snack-y” sides (pretzels, chips, granola bars, etc.) This will make it fast and easy to grab what you need. Note that, when planning your weekly lunch menu, it is best to stick with foods that you can portion out ahead of time. You may not want to plan on apple slices, for example; you cannot cut them up far in advance, or they’ll turn brown. Prep Your “Main Course”. “Main Course” items, like sandwiches, are harder to prepare in advance. A week-old peanut butter & jelly sandwich is not exactly appetizing, after all! Instead, prep your main course ingredients; this will make it easy to assemble sandwiches each morning. For example, if you’ll be making ham and cheese sandwiches, slice up cheese, lettuce, and tomatoes ahead of time, and bag them up for later. Or, make a big dish of tuna salad or chicken salad, and then use it for sandwiches throughout the week. Each Night, Lay Everything Out. This may seem like a small step, but I have found that doing this saves my sanity in the morning. Each night, lay out your child’s lunchbox, and fill it with all the non-perishable things he will eat the next day – juice boxes, napkins and utensils, dry-good snacks, etc. Then, group all the perishable lunch food (fruit, veggies, cheese, etc.) in one spot in the fridge, so that you can grab them quickly the next morning and add them to the lunchbox. Note that, while you certainly can make sandwiches the night before (in order to save time) you may want to wait and make them the next morning. Doing so will ensure that they stay fresh and appetizing for lunch. Each Morning, Do Last-Minute Assembly and Pack. In the morning, grab all the perishable food from the fridge and add it to the lunchbox. If you haven’t made the main course yet, go ahead and prepare that, and add it to the lunchbox. And don’t forget to include a freezer pack! Have some time-saving tips of your own for packing school lunches? We want to hear them – share them below! Back-to-school means lots of new routines, and that can also mean new sleep challenges! Please be sure to pick up your FREE copy of 5 (tear-free) Ways to Help Your Child Sleep Through the Night, our e-Book with tear-free tips to help your baby sleep better. For those persistent nighttime struggles, check out The 3-Step System to Help Your Baby Sleep (babies) or The 5-Step System to Better Toddler Sleep (toddlers). Using a unique approach and practical tools for success, our e-books help you and your baby sleep through the night and nap better. For those looking for a more customized solution for your unique situation with support along the way, please consider one-on-one baby and toddler sleep consultations, where you will receive a Personalized Sleep Plan™ you can feel good about! Sometimes it’s not that you can’t make a plan. Sometimes you’re just too tired to. Emily, “my” girls are 11, 9, and 5 (five and a half if she’s talking, though!). During the summer, they all fold and put away their own laundry–the youngest ends up with some messy drawers, but it’s good practice for me to not be so obsessively compulsively neat to just let it go! I help more with folding during the school year because they’re busier. But we haven’t gotten anyone else doing the wash yet–their mom and I are worried that things will end up ruined, and that would be an expensive mistake! I’ll just add that the youngest definitely needs more guidance with packing her lunch. And she can’t really make her own sandwiches yet. But she selects the foods and gets out the containers which is pretty great! Good luck with yours! PS, Benjamin (now almost 8 months old) is napping SOOO much better. I can’t thank you guys enough! Everyone always says how happy he is and I just know that it’s because we worked so hard on getting him the sleep that he needs. To have apples pre-sliced for the week: slice them then soak them in ice cold water for 5 minutes, then soak them in a lemon/lime soda like Sprite for five minutes. I saw this idea on Facebook and wanted to try it for my independent 26 month old. It works!! They turn a tiny bit on day one but after that mine didn’t turn any more. This would be a great way to have pre-sliced apples for snacks or lunches. Opal Apples don’t turn at all – and you don’t have to do anything to them. Provide “either-or” options (such as cucumber OR broccoli) for stumped kids. Require that everyone include a fruit, vegetable, protein, and starch. Extras are just bonus! I’ve noticed that when they pack their own lunches, they eat most of it 🙂 They also have to empty out their own lunchboxes when they get home (I or their mom wash the dishes, though). @ Kate – love this idea! If you don’t mind my asking – how old are the girls you nanny? I’m always curious about when I can start expecting my kids to do more things for themselves (i.e. when they can start doing their own laundry, cleaning their bathroom, etc.) I hadn’t thought about having them pack their own lunches, though — you’ve given me something to think about! Good suggestions, too, and I like your observation about the fact that kids who pack may be more inclined to actually eat the food! @ Alisha – what an innovative idea! I’ve never thought of doing this. Based on your own experimentation, how long will pre-sliced apples last once you soak them? A few days, maybe?